Or is it? Jay Baer has said, “Our personal and commercial lives have collided in unprecedented ways.” The behaviors and attitudes we’ve adopted in recent years — thanks to our daily exposure to smartphones, social channels, and other tech advancements — are blending into our business lives. The study shows that B2B marketers can no longer afford to tell themselves that B2C marketing trends don’t apply to them. It’s not that B2B and B2C audiences are the same, but rather, the research reveals that consumers’ expectations of companies are very similar for both B2B and B2C buyers. Here are three ways that business buyers’ expectations align with consumer expectations in ways that could be mislabeled as “B2C marketing” trends. While “real-time interactions” in the B2C world may point to social channels, the ability for B2B companies to respond immediately is no less important. 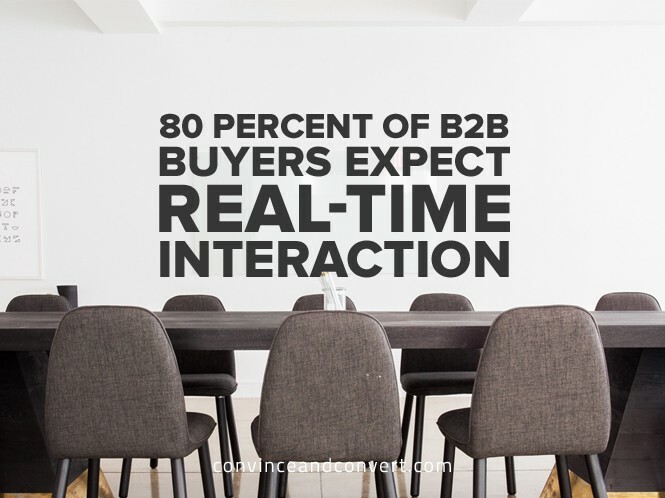 In fact, 80 percent of business buyers expect companies to respond and interact with them in real time. Despite the high bar set for real-time email response, B2B marketers’ use of marketing automation is still lower than you might guess. The “2016 State of Marketing” research shows that only 11 percent of underperforming B2B marketers extensively use marketing automation — but even among high-performing B2B teams, only half (49 percent) say the same. As consumers, we’ve witnessed how retailers apply the data they know about us to personalize marketing. For instance, we’ve all received offers personalized with our name, gender, location, or recommendations. But as B2C marketers raise the stakes for personalization, B2B marketers would do well to follow suit. Why? Not only do three-quarters of business buyers expect companies to send their company personalized offers, 74 percent agree that receiving these personalized offers has a major or moderate influence on their loyalty. This is even higher than the percentage of consumers who say the same (65 percent). That’s not all: Nearly two-thirds (65 percent) of business buyers go so far as to say that they’d likely switch brands if a company didn’t make an effort to personalize communications with their business. But are marketers living up to those expectations? From the “2016 State of Marketing” research, we know that only 37 percent of B2B marketers are leveraging predictive intelligence/data science to create personalized emails. The percent who trigger real-time emails based on events is even lower (30 percent). When it comes to personalizing advertising, B2B marketers gain some ground. Sixty-eight percent use demographic data (e.g., age or gender), 74 percent use customer data (e.g., email or phone data), and 69 percent use website activity data (e.g., retargeting cookies) to segment or target their company’s advertising. While shoppers who are showrooming may be B2C marketers’ worst nightmare (especially heading into the holidays), B2B marketers must realize that today’s business buyers are likewise more in control than they’ve ever been. Eighty-three percent of business buyers agree that technology has kept their company more informed about choices than ever before. And the more readily business buyers can use tech to understand all of their options, the easier it becomes to take their business elsewhere (82 percent of buyers agree). 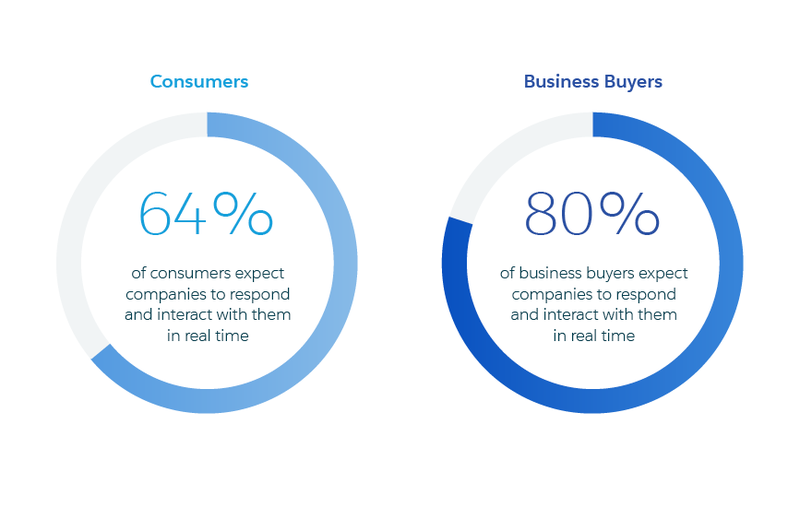 The implications of this are simple but immense: Your business buyers expect the same level (if not higher) of real-time attention and personalized interactions as consumers. If they don’t see B2B marketers making strides toward delivering that, they’re well-positioned to find another provider who will. Be there for your business buyers to interact in real time. Personalize as much as possible along every step of the customer’s journey. Remember that your buyers have never held more power to choose. Will we use the term B2B or B2C in 2017? Yes, certainly, but what about the next few years? The data from Salesforce Research proves that no matter what they are buying, or how they buy it, customers have a core set of expectations. They expect to be engaged in real time, and on a personal level. This is now the baseline of expectations, which all businesses must reach, no matter how complex the buying cycle or miniscule the purchase. Without the focus on the individual, relationships cannot be built — and as this research shows, those relationships are very powerful. Failure to acknowledge this will result in missed opportunities and a significantly declining customer base. Moving forward, try to strike the terms “B2B” and “B2C” from your mind, and remember that despite what you’re selling, your customers are individuals who demand to be treated as such. Led by Jay Baer, we provide digital marketing and customer experience counsel for world's most important brands.